Rep. Dan Moul receives the first place ribbon following the Celebrity Draft Horse Driving Competition at the 2014 Pennsylvania Farm Show. (L-R) Sen. Mike Waugh (R-York), Miss Pennsylvania, Annie Rosellini and Moul. 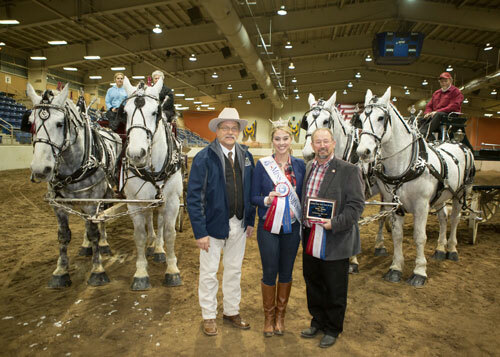 HARRISBURG - The third time was the charm for Rep. Dan Moul (R-Adams/Franklin) who bested 15 other competitors to win the Celebrity Draft Horse Driving completion at the 2014 Pennsylvania Farm Show on Tuesday evening. Moul skillfully drove his team of horses around an obstacle course in the Farm Show Complex equine arena, finishing a full 10 seconds ahead of his nearest competitor. “I enjoy this competition and the camaraderie with other legislators, public officials and members of the agriculture community,” said Moul. “This was a lot of fun for me, but the real winner is the Pennsylvania Farm Show Scholarship Foundation, which benefits from donations by event sponsors.” Hanover Shoe Farms, from Moul’s legislative district, sponsored his team of horses. “This competition raises money for scholarships to educate the young people who represent the future of Pennsylvania agriculture,” said Moul. According to the Department of Agriculture, since the foundation was established in 1993, it has awarded more than $1 million in scholarships to nearly 400 members of FFA and 4-H who demonstrated commitment to Pennsylvania agriculture.